We started this summer out strong with scripture memory. Each morning we each sat quietly in the living room, reading our own books, reviewing our own memory packets, and memorizing our own new verses. This lasted for about a minute, not the entire summer like I had hoped. But was I ever crafty! I mean, I made my own laundry detergent for Pete's sake. For some of you this is probably old news. You've been making your own soap, lip balm, lotion, weaving your own shirts and baskets, and grinding your own wheat to make homemade bread unless, of course, you're gluten free. For me, making laundry soap is very homestead spectacular. All joking aside, I love the stuff. It only costs me about ten bucks to make. When I take the clothes out of the washer, they feel clean without any residue. I would encourage you to try it if you are into that sort of thing. I won't go back to store bought laundry detergent. Ok. Let's just be real. I'm not that committed. I'll go back to store bought as soon as I have a hundred loads piling up and no supplies to make more. The ease of a Costco run will beckon me away from my clean, dye free, chemical free, tree hugging, homemade, wonder soap. The shadows over the detergent prove to you what a fantastic photographer I am, but I desired to give you proof of homemade soap. You can find my original pinterest pin here. And by crafty, I mean craaaa-fty. The pin that gave me this pinteresting idea had no instructions, so I just had to wing it. Tori gave me a gift card to Hobby Lobby for my birthday that had been burning a hole in my pocket for months, but I wanted to be purposeful with my purchase so I just held onto it until I knew exactly what I wanted to create. Mod Podge makes me feel like I could be a designer on HGTV. On this day of crafts, I used Mod Podge, spray varnish, and a hot glue gun. I wondered a few times where my normal craft heebie jeebies fled because I actually had a great time creating! The finished product is very cute. I love it. However, there is a design flaw for now. 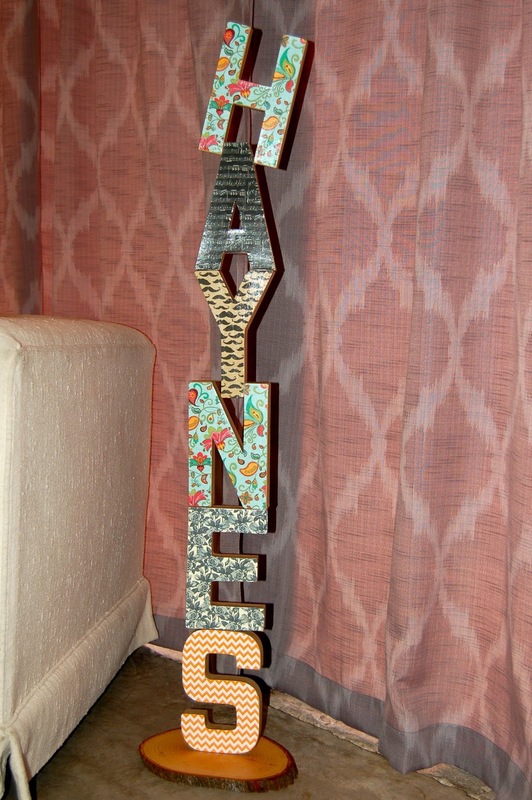 I need some sort of dowel to run through the letters to make it more stable, but I don't want the rod to show. Do you know when I'm going to figure out the stability situation for this name tower? Probably never. I've exhausted my craftiness for the next few years. We've been living in our house for five years which means we've been working on our house for five years. I'm blessed to be married to a guy that knows how to do so much. He recruits help and works in his free time. Many people in our community have left their marks on our home projects. Thanks to all of you for your help! We appreciate you so much! 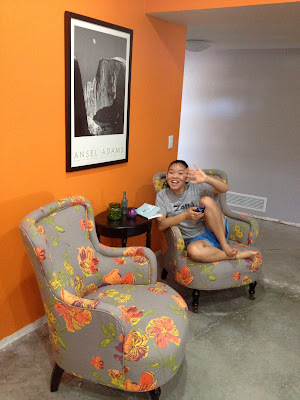 Painted walls have completely changed how we feel about the space. Orange may not be for everyone, but the bright colors inspire creativity and fun and we want our teenage kids and their friends to know this is a fun home. It's part of our parenting strategy. We spend many hours playing in our new "rec room." These two obsess over ping pong. Orange and gray. I love it. We will take care of floors at some point. DIY and budget restrict what you can do and when you can do it. Can you relate? This will be a work in progress. I plan to add to and rearrange often. My kids already make fun of me for how much I mess with it. I want the shelves to be filled with meaningful items...gifts from people I love, photos, decor from my masquerade party. I look forward to how it morphs through the years. This room is just off the rec room. The whole space is open. Kids can study, watch their own weird shows, play Skip Bo for dayz. And yes, we are crazy enough to have a white sofa. We found it at a consignment shop, vintage 1960s for an amazing price. That's right. I have crafts and vintage stuff. Who am I? What have you been up to lately? Do you have any fun projects to share with us? I would love to know about it! Love the orange ~ what a fun, energizing color! I miss the green and yellow walls of my VA house. Rental house is BEIGE. Ugh... Love the Haynes project. Very cool. Might have to look up that idea. I love HL and Mod Podge. I think I need to come visit you in Tucson!